As long as we have different political parties we will always have a difference of opinions. A U.S. House congressional hearing was held recently in McAllen, Texas to discuss the current immigration crisis that has swept across South Texas – thousands of illegal immigrants making their way from Central America to the United States of America. Texas Governor Rick Perry is adamant the flow of immigrants must stop. The flyer he mentions refers to the rumors spreading throughout countries in Central America that if immigrants, especially women with small children, make their way to the United States they will be allowed to stay in the U.S.
I’m broken up over the issue. I think I understand the plight of the women – thousands upon thousands of them – wanting to leave what they say are their battle scarred, cartel controlled towns. I have nothing in my life to even begin to comprehend what their families have endured. A few weeks ago I drove near the bus station wondering if I’d find Central Americans arriving in the Valley. It didn’t take but a few seconds to find a group walking through town. Four young women with eight small children. In one hand each woman held tightly to the youngest children and in the other they each carried backpacks and jackets. That’s it. No luggage. No food. No car. No smartphone. No ear buds. Just 12 people 1000 miles away from home walking along a street in the Rio Grande Valley in the middle of a blistering South Texas afternoon. Oh dear Lord that’s all we need in the Rio Grande Valley … another influx of Americans making their way to the border. Each time I read another story I wonder should the immigrants be allowed to remain in our country or should they be sent back to their own? Should the militiamen and others be allowed to stay in our communities or should we send them back to their own? I understand the power of prayer. It is part of my daily life. It is how I was raised. We went to Catholic school as children. We had to say our prayers during class and the nuns had us go to confession often. Growing up my grandmother always kept an altar in her bedroom with a large statue of La Virgen de Guadalupe, a rosary and pictures of loved ones. She always had a candle burning as part of her faith. But I am certain none of those candles ever had an image of Pancho Villa. La Virgen – yes. St. Jude – surely. Jesus Christ – definitely! But Pancho Villa is a definite no. I came across these candles in the one tiny store you’ll find in Lozano, Texas. It is a community off the beaten path. 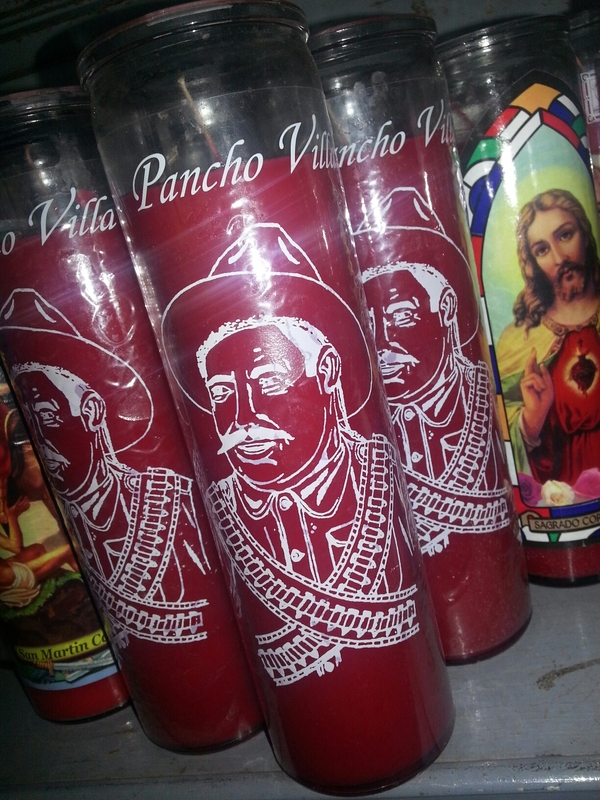 The store had candles like my grandmother used, but right in the front it had these red candles with Pancho Villa. I’m certain my grandmother never would have said her prayers to Pancho Villa even though my dad, her oldest son who was named after her brother, was nicknamed Pancho. 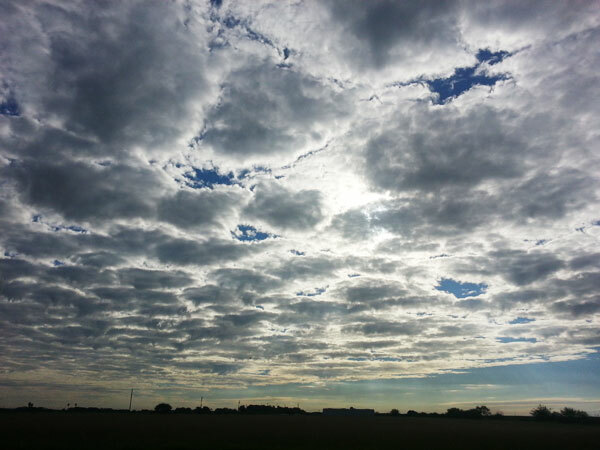 It was a beautiful day in South Texas today, so I told my mom to get in the truck and we took a long drive out in the country. I drove the Military Highway which borders the Rio Grande – the river that separates the U.S. from Mexico. In the distance you could see the Border Patrol and the security towers that mark the river’s edge. You can’t have a family Easter along the Texas-Mexico border without dozens of cascarones. What are they you ask? Colorful egg shells filled with confetti that you’ll crack on everyone’s head. In the Rio Grande Valley of Texas there’s three ways to get a hold of cascarones. The traditional method is to start saving the egg shells months ahead of the holiday. Each time you make breakfast, you gently crack the egg shell on the pointy top and peel back a small circular section of the shell. Shake out the egg, rinse the shell and set the shell aside to dry. When you make breakfast the next day you’ll do it all over again. Maybe you baked a cake for work or cupcakes for your children. Save those shells as well. You’ll soon realize you’ve got several dozen egg shells. A few days before Easter get your family together and dye the eggs. You can buy prepackaged dye kits, use food coloring or just let the kids go silly with markers. Fill the eggs with confetti, put a dab of glue along the edge and seal them with a piece of colorful tissue paper. But like all things the Easter tradition has changed for many families. If you’re watching your cholesterol and might not eat a lot of eggs. Maybe you forgot to save them or just don’t have the time. That’s when you can visit your local grocery or discount store and buy the eggs already painted and filled with confetti. For less than $2 a dozen you’ll have the same fun as if you’d dyed the eggs yourself. Option number three is paying the people at the street corner for cascarones. That’s right. In the Rio Grande Valley lots of folks save egg shells all year long. Others collect them from restaurants or friends and family. They color and fill the eggs and then sell them at busy intersections a few days before Easter. For about $6 you can buy a tray of 2.5 dozen ready made confetti eggs. However you get your cascarones, trust me everyone will have fun!